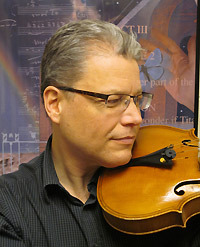 Tim Nelson is currently the orchestra teacher at South High School in Fargo, Principal Violist with the Fargo Moorhead Symphony, violist with the FM Symphony’s 8th Street Quartet, and an adjunct viola instructor at Minnesota State University, Moorhead. The 8th Street Quartet maintains an active concert schedule in the North Dakota/Minnesota region, performing chamber music from Bach to the twenty-first century. He received a BM degree from the University of Wisconsin, Superior and an MM from the Juilliard School, with emphasis in viola performance. For the ten years preceding coming to the Fargo Moorhead area he was principal violist with the Arkansas Symphony in Little Rock, and violist in the Quapaw String Quartet, the members of which formed the full time salaried core of the Arkansas Symphony.